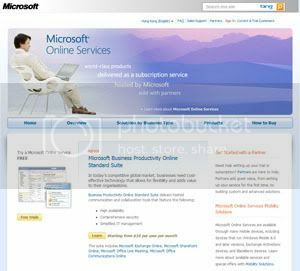 In list of Microsoft Online Services there is an addup where commercial launch of Microsoft Online Services and Windows Azure witnessed worldwide in HongKong. More than 40 million paying end users are counted on using Microsoft Online Services around th world which joins to its truly global cloud solution for communications and collaboation ready for global business. We can count as customers of this service which include 7 of the top 10 global energy companies, 13 of the top 20 global telecom firms, 15 of the top 20 global banks, and 16 of the top 20 global pharmaceutical companies, and many more of the world’s top global businesses are already using cloud services from Microsoft. Microsoft is investing over US$1B in datacenters and already has 20 datacenters worldwide, including Hong Kong and Singapore. As per David Hooper, Information Worker Business Group lead of Microsoft Hong Kong.